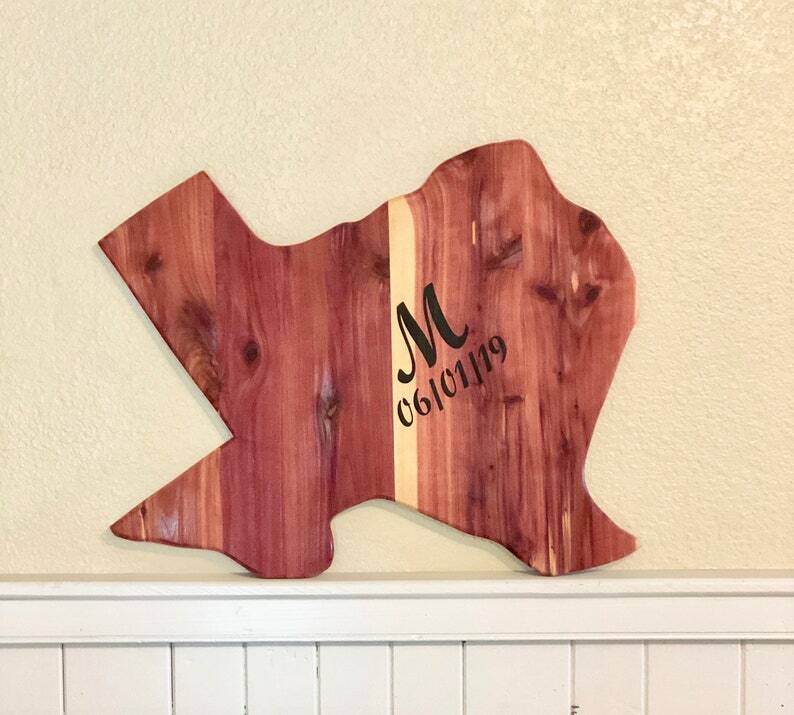 We recently had a request for a Guest Book in the shape of the State of Texas; and since we specialize in Texas Aromatic Red Cedar, it was the perfect addition to our shop. This piece measures 24" wide by 24" tall and is 1" in thickness. It's been planed and sanded repeatedly giving it a wonderfully smooth surface for your well wishes. We suggest using a sharpie type permanent marker, but we've also had folks use regular pens. Item will ship by FedEx Ground. Shipping will be combined if possible on orders of more than one piece. Convo me for a reserved listing on multiples if desired. I do not profit on shipping and will refund any shipping overage more than $5.00. Local pickup of multiple pieces is available, welcome and encouraged. Please convo me for exact location specifics (Central TX). This is a completely natural wood product. You may find some saw dust residue. The surface may also lightly crack as it dries out. It also smells like cedar. None of this will affect the intended purpose and is completely a natural characteristic of a fresh cut wood product. Just want you to know.